Orrin "Checkmate" Hudson is a chess champion. He's the number one best selling author of One Move at a Time - How to Win at Chess and Life. 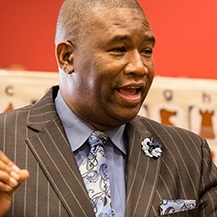 He is a strategist, an inspirational speaker, and he's the founder of Be Someone (besomeone.org is the Web site) and he's created a successful youth development program for students across the country by teaching them the game of life through the game of chess.